We are currently offering junior taster sculling sessions (for those in year 7 or above) at Avon County Rowing Club in Saltford. The sessions will be on Sunday 17th, Sunday 24th or Sunday 31st March 2019, at 8:45am, 9:45am or 10:45am. Sessions last about 1 ¼ hours. Coxes, rowers and coaches of any age and ability are very welcome – we encourage prospective members to come and give rowing a try with us on our beautiful stretch of river. If you’re interested in joining, please see the information above, or contact us (see Contact Us page). If you would like first to have a look at what we do, come down and see us at the river. Please pay by Direct Debit if possible. Information about payment is included in the Membership Form – see below. You’ll need to supply your own athletic clothing which should allow ease of movement and be warm enough for the time of year. We have a supply of club clothing and there are several companies who sell rowing kit online. 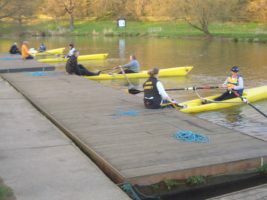 When you compete in a rowing race, you will need to pay an entry fee (usually between £8 and £12 per head) and a towing charge. This is currently £5 per person, per event (juniors £4) and is used to cover the fuel costs of the person towing and – if required – the hire of a towing vehicle. You will also need to take out membership of British Rowing. Membership of Avon County is open to anyone, provided they can swim at least 100 metres in light clothing. As part of your induction to rowing and to the club, important safety education will be provided and we ask that you take careful heed of this.